The KEVLAR® thread we sell has a breaking strain of 12.5Kg. It is ideal for stitching KEVLAR® wick onto fire props. If you keep the stitches deep within the wick and pulled tight it will last for years. However if you let the fire wicks smoulder by allowing all the fuel to be used up then the KEVLAR® wick will burn away slowly and fall apart and eventually do the same to the thread. Sunlight also degrades and darkens the color of KEVLAR® wick slowly over time. So it is good to have wick covers when using Fire Props during daylight, it also stops you getting your daytime clothes dirty from the residues on the wicks. 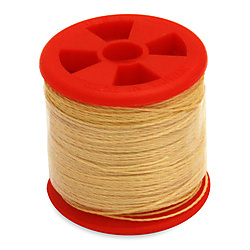 Because of how expensive KEVLAR® is compared to other threads we sell on small spools (which is the most popular size). If you want only a small amount we also sell per meter or per ft (units depend on the language settings) and if you are a big time manufacturer we have the large spools also available. KEVLAR® is one of the most important manmade organic fibers ever developed. Because of its unique combination of properties, KEVLAR® is used today in a wide variety of industrial applications. KEVLAR® para-aramid fiber possesses a remarkable combination of properties that has led to its adoption in a variety of end-uses since its commercial introduction in the early 1970's. "I made my own wick head thanks to this thread has well as repaired some old heads. I will resist to flame heats." "Used this Kevlar string to stitch Kevlar wick onto a fire knife I was working on. So far, it has held together very well even after several burns. Happy with what I got." "Exactly as described. Used this thread to put my first wicks on. I'm about 6 burns in now and it's held up just fine. My wicks have a long life ahead! It's worth getting some to have on hand for repairs"
"Perfect string to build the kevlar parts of my fans, strong, flexible and long lasting." "a great item, solid and strong, Take it for my wick creations." "Every burner needs a roll of this in your burn kit"
"Awesome stuff! Easy to use and works perfectly, plus it arrived a lot quicker than I expected"
"Tried others but Home of Poi has the best quality." "Hilo de calidad, fuerte y resistente!! Buena compra :)"
"you can tell this stuff is legit as soon as you try to cut the length you want with a normally good pair of scissors and it takes several attempts to finally get through it! perfect stuff for any prop where you don't want the risk of exposed metal on the wick."